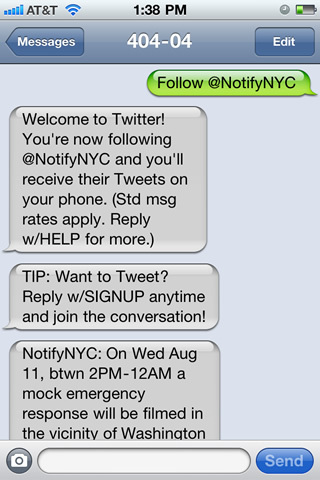 Twitter users in the U.S. can now follow Twitter accounts via SMS without actually signing up for Twitter. You can also now sign up for Twitter via SMS . To follow someone this way, text "follow UserNameHere" to 40404. To Sign up, text "Signup". "We’ve always been big fans of trusty SMS messaging. In fact, sending a text was originally the only way users could tweet. This is why Tweets are 140 characters — they need to fit into a text message," says Twitter’s Leland Rechis. "We value SMS because it’s simple, instant and universal." Users can also now get SMS alerts from Twitter accounts they wish to. From a computer, you can hover over a user’s name or avatar, and click on the little phone icon that appears in the "hovercard". You will then get a text every time that user tweets – probably not a good idea unless you have an unlimited text plan. You can also set alerts from your phone by sending "on [username]" or "off [username]" to 40404. You can send "on" or "off" to start and stop text messages altogether. Finally, if you text "get [username]" the user’s most recent tweet will be sent to you phone. There are more commands here. In other Twitter news, Mashable is reporting that the company will launch its official Tweet button this week. This is for publishers to stick on their content and increase traffic.